1) American Viticultural Areas (AVAs) are distinct grape-growing regions that have unique geographical characteristics. Because of climate, soil, and growing conditions, the grapes grown in one AVA will have qualities, aromas, and flavors different from grapes grown in another region. These differences can be detected in the wine made from those grapes. At least 80% of the grapes in this wine were grown in the Texas High Plains. 2) If a wine is made of 80% grapes from a particular AVA, then the wine can be labeled with that AVA. The grapes in this wine made by Texas Hills Vineyard were all grown in the Texas High Plains, and more specifically, at Newsom Vineyards. 3) If all of the grapes in a wine come from a single county or vineyard, then the bottle can be labeled more specifically. Many wines are made of grapes from different vineyards in the same AVA, and so only bear the name of that region on the label. The grapes for this Pinot Noir were grown in different vineyards all in Monterey County. 4) Grapes can be grown outside of an AVA. Wines made from those grapes can’t be labeled as coming from a particular region, however. 5) AVAs are officially designated by the U.S. Alcohol and Tobacco Tax and Trade Bureau. The first AVA designation was made in 1980. There are now 238 AVAs in thirty-three states. 6) There are eight AVAs in Texas. Some are located inside other ones. 7) The Texas High Plains AVA is responsible for producing 80-90% of the grapes in Texas. There are about 3,000 acres of grapes planted within the 8,000,000 acres of the Texas High Plains. This is by far the best place in Texas to grow grapes. 8) The Texas Hill Country AVA was designated in 1991. It is the second largest in the country, covering 9,000,000 acres. But only 700 acres within that area are planted in grapes. 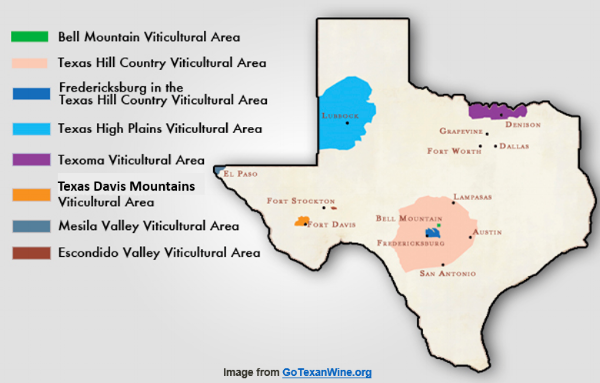 9) The Texas Hill Country AVA is also the southernmost AVA that has been designated. That means that grape growers here must be very careful about the types of grapes they plant; they must be well-suited to relatively warm and humid growing conditions. 10) There are fifty-three wineries in the Texas Hill Country, but most of the grapes they use are supplied from the Texas High Plains, or from out of state. © 2015-2019 Texas Wine Tours, LLC.